Bonvin will showcase two series of photographs focused on peripheral urban spaces, which she produced whilst in residency in Johannesburg and Cape Town in 2009. Her work is concerned with urban landscapes and asks questions about the functionalist architecture of South African cities and how it affects those who live there. A version of this exhibition was shown at Blank Projects in Cape Town in November 2010. Accompanying these two series will be a selection of works by Akona Kenqu, Mack Magagane, Mamaki Rakotsoana and Pako Magabane, all alumni of the Market Photo Workshop, who produced these works with Bonvin while she was their trainer in the Advanced Programme course in 2009. The selection from these different bodies of work is largely influenced by similar issues to those of Bonvin, looking particularly at urban and peri-urban landscapes and the nuances of human occupation in these peripheral spaces. The title of the exhibition, IN/OUT, relates to the question of the frame, to inclusion and exclusion as well as to the artists’s position as observers and simultaneously as members of society thus investigating the boundaries between observation and participation. 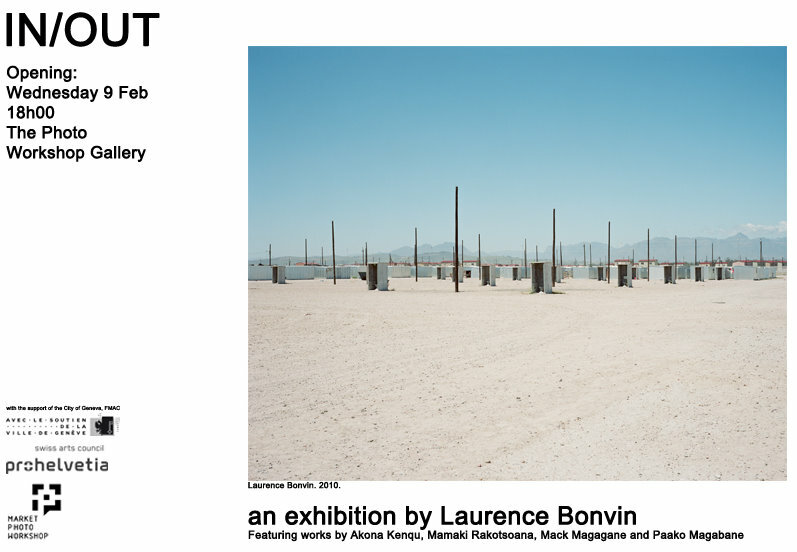 IN/OUT is supported by Pro Helvetia, the City of Geneva (FMAC), and the National Arts Council of South Africa and will open at The Photo Workshop Gallery on the 9th of February 2011 at 18h00. A walkabout will be held with the photographers on the 16th of February from 13h00 and the exhibition closes on the 16th of March. Laurence Bonvin was born in Switzerland and studied photography in Arles, France. Her photographic work is mostly concerned with suburban environments and landscapes. She currently lives and works between Geneva and Berlin. For further information and interviews, please contact Stacey Vorster at staceyv@marketphotoworkshop.co.za.